At the W. Eugene Smith Fund's 38th annual awards ceremony at the School of Visual Arts Theater in New York City last night, the organization awarded its prestigious Smith Grant, two Smith Fund Fellowships and the Chapnick Grant. Selected from a field of 12 finalists, London-based photographer Daniel Castro Garcia has been awarded the Grant in Humanistic Photography for his project Foreigner: I Peri N'Tera, a Sicilian colloquialism that translates to "feet on the ground." Boat Graveyard. 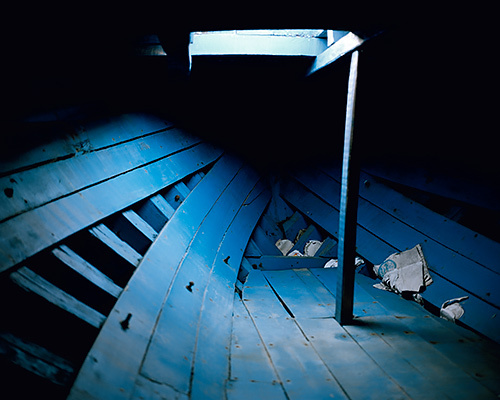 The hull of a migrant/refugee boat which now rests in a large boat graveyard in a secluded area of the island of Lampedusa. Over 100 people are often packed into the hull of these boats at great risk to themselves. These are the 'cheap seats' and passengers face multiple risks such as hypothermia, asphyxiation from engine fumes and chemical burns from petrol mixing with seawater. The project, which can be seen at the Smith Fund site, takes a hard look at unemployment, exploitative labor and the difficult process of receiving documentation in a new land. The Smith Grant will allow Garcia to continue his project with subsequent chapters set to explore the psychological impact of these journeys and the struggles of integrating into new communities throughout Europe. Receiving the W. Eugene Smith Memorial Fund Grant in Humanistic Photography presents me with the most humbling and extraordinary achievement in my professional career. This support and infrastructure for my project is invaluable and it will enable the continuation of a project I believe can make a positive contribution to individual lives and a wider audience. I am incredibly grateful and moved to be given this vote of confidence and support and I will endeavor to respect the standards and expectations of both previous recipients and the W. Eugene Smith Memorial Fund organization. Whilst there are causes and truths worth fighting for ... it is essential to fight for them and not give up. The project has resulted in the self-published Foreigner: Migration into Europe 2015-2016. It is vital to emphasise that I do not wish to create a body of work that defines these children as simply being victims. No aspect of this project aims to develop a sentiment of pity or sorrow. Their experiences are a reality, and an emotional response to them will not change anything. The key with this work is to engage on a deeper level and avoid sensationalist conclusions. Trauma is a reality in their lives yet it does not need to control or destroy their futures. What is needed is critical and in-depth analysis of the situation and a valid consideration must be held for the potential consequences of ignoring their problems. Photographers Edmund Clark and Alex Majoli were also honored, each receiving a full $5,000 Smith Fund Fellowship, a first in the Fund's history. Clark's project The Unseen Consequences and Networks of Air Strikes and Drone Warfare is a multi-media investigation of the expanded use of air-strikes and drone weapons in the on-going conflicts in Afghanistan, Iraq, Libya, Pakistan, Somalia, Syria and Yemen. Unseen Consequences. 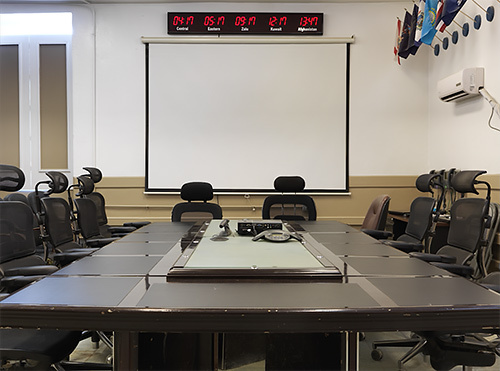 Image of a command center for drone strikes from Clark's video presentation. Majoli's project, Titanic, deals with changes to European identity as it grapples with the crisis unfolding across the Mediterranean. His photographic approach intentionally makes it difficult to separate fact from fiction. Majoli. Each person 'plays a specific role, just like in a theater play, in the events transpiring in Europe,' Majoli says. "The $5,000 Smith Fellowship is important, of course, but given at the jury's discretion," Bill Hunt explained. "Two fellows were selected for recognition. The Jury petitioned the Board to request that both receive the $5,000 Fellowships rather than split it equally as in the past. It is the first time in the Fund's history." Michael Shaw, founder and publisher of Reading the Pictures, was awarded the Chapnick Grant, awarded for leadership in any field ancillary to photojournalism, such as picture editing, research, education and management. Reading the Pictures. 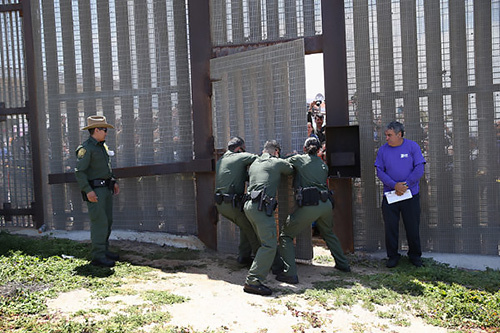 An image from Shaw's border wall project, courtesy of Getty Images. The Reading the Pictures Salon is a documentary research project and online webcast analyzing the visual representation of major social issues. The project, "U.S. Media's Visual Representation of the U.S./Mexico Border Wall," focuses on how the barrier has been characterized. It will also explore how photographers and the media are using imagery to capture the political narrative, inject opinions or to outright challenge the wall from a human rights and social justice perspective. I am honored to receive the Howard Chapnick grant on behalf of myself and Reading the Pictures. I never had the privilege to meet Chapnick, but I greatly appreciate his legacy. He was dedicated to photographers, to developing their vision and to capturing deeper truths. We feel his conscience is in our work. Chapnick might have been surprised by how much photography and visual culture have taken off and now permeates daily life. But I'm certain the commitment to understanding that imagery and helping people read it, is a mission he would have thoroughly recognized. NEW YORK -- The W. Eugene Smith Memorial Fund is pleased to announce that Daniel Castro Garcia is the recipient of the Grant in Humanistic Photography for his project Foreigner: I Peri N'Tera, a Sicilian colloquialism that translates to "feet on the ground." Selected from a talented group of 12 finalists, Foreigner is the second chapter of Garcia's ongoing project on the migrant/refugee crisis in Europe, focusing on Sicily, Italy, and capturing the lives of those who survived the long journey across the Sahara Desert and Mediterranean Sea. The project takes a hard look at unemployment, exploitative labor and the difficult process of receiving documentation in a new land. The Smith Grant will allow Garcia to continue his project with subsequent chapters set to explore the psychological impact of these journeys and the struggles of integrating into new communities throughout Europe. The annual grant, which was increased to $35,000 by the Smith Fund's board of directors this year, was presented to Garcia during the organization's 38th annual awards ceremony at the School of Visual Arts Theater in New York City Wednesday evening. "Receiving the W. Eugene Smith Memorial Fund Grant in Humanistic Photography presents me with the most humbling and extraordinary achievement in my professional career," he told attendees at the SVA Theater. "This support and infrastructure for my project is invaluable and it will enable the continuation of a project I believe can make a positive contribution to individual lives and a wider audience. I am incredibly grateful and moved to be given this vote of confidence and support and I will endeavor to respect the standards and expectations of both previous recipients and the W. Eugene Smith Memorial Fund organization." The W. Eugene Smith Memorial Fund is presented annually to photographers whose work is judged by a panel of experts to be in the best tradition of the compassionate dedication exhibited by W. Eugene Smith during his 45-year career in photojournalism. The grant enables recipients to undertake and complete worthy photojournalistic projects. "The judges were struck by Garcia's humanism which is appropriate for a grant that honors the legacy of W. Eugene Smith," explained W.M. Hunt, longtime Smith Fund board member and the Chair of this year's adjudication committee. "The pleasure of judging the Smith Fund is the strength and range of the work submitted. The judges were aware that having 12 finalists would be a bit unwieldy, but they wanted to ask questions and consider each of the proposals for a longer time," Hunt continued. "They are delighted with the selection of Daniel Castro Garcia as the $35,000 Smith Grant Recipient and felt his work was blessed with clarity and wonder." Garcia undertook his Foreigner project in May 2015, one month after reading about two boats that capsized in the Mediterranean Sea with an estimated 1,000 people dead. As select British media outlets used adjectives such as "cockroaches" to describe those who were onboard the vessels, Garcia made an unbreakable commitment to himself and this project, driven by the desire and belief that proximity and engagement with people could provide answers that often go unheard. As the son of migrants himself, he did not feel represented by the way the images of this crisis were used by the media, nor did he agree with the tone of the narrative being used to discuss migration as a solely negative issue. Feeling that much of the image-making and reporting were questionable, he set out to determine the truth and share his findings through his photographs and written word. 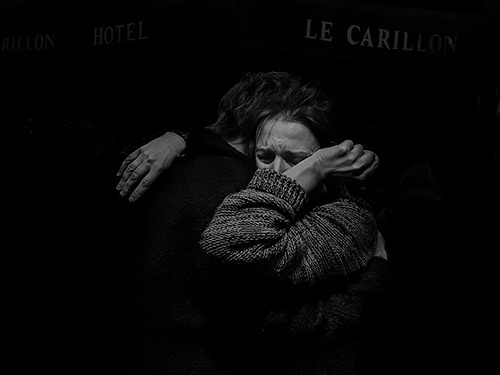 Photographers Edmund Clark and Alex Majoli were also honored, each receiving a $5,000 Smith Fund Fellowship. Clark's project "The Unseen Consequences and Networks of Air Strikes and Drone Warfare" is intended as a multi-media investigation of the expanded use of air-strikes and drone weapons as the primary strategy of the on-going American-led War of Terror in Afghanistan, Iraq, Libya, Pakistan, Somalia, Syria and Yemen. Majoli's project, "Titanic," deals with the fragmentation and polarization of Europe's identity as it grapples to come to terms with the realization that it can no longer isolate itself from the crisis unfolding just across the Mediterranean. His photographic approach intentionally makes it difficult to separate fact from fiction. Judges for this year's grant and fellowship included W.M. Hunt, Mitra Abbaspour and Enrica Vigano (Italy). Hunt is a New York City-based collector, former-dealer, writer, teacher and longtime member of the Smith Fund Board of Directors. Mitra Abbaspour is an art historian specializing in the history of photography and art of the modern and contemporary Middle East. Vigano is a curator of photography from Milano, Italy. In 2009 she founded Admira, an organization specializing in cultural events and traveling exhibitions in the field of photography including "W. Eugene Smith: More Real Than Reality." Recipients of the W. Eugene Smith Memorial Fund grant and fellowships were selected from hundreds of submissions received from 51 countries. Recent recipients of the grant include Justyna Mielnikiewicz (2016), Matt Black (2015), Joseph Sywenkyj (2014), Robin Hammond (2013) and Peter van Agtmael (2012). A complete listing of recipients can be viewed at SmithFund.org. This year's Howard Chapnick Grant was presented to Michael Shaw, founder and publisher of Reading the Pictures, a Web-based educational and publishing organization dedicated to visual culture, visual literacy and media literacy through the analysis of news, documentary and social media images. The grant is awarded to an individual for his or her leadership in any field ancillary to photojournalism, such as picture editing, research, education and management. The Reading the Pictures Salon is a documentary research project and online webcast analyzing the visual representation of major social issues. The project, "U.S. Media's Visual Representation of the U.S./Mexico Border Wall," focuses on how that controversial barrier has been characterized. It will also explore how photographers and the media are using imagery to capture the political narrative, inject opinions or to outright challenge the wall from a human rights and social justice perspective. "I am honored to receive the Howard Chapnick grant on behalf of myself and Reading the Pictures," Shaw said. "I never had the privilege to meet Chapnick, but I greatly appreciate his legacy. He was dedicated to photographers, to developing their vision and to capturing deeper truths. We feel his conscience is in our work. Chapnick might have been surprised by how much photography and visual culture have taken off and now permeates daily life. But I'm certain the commitment to understanding that imagery and helping people read it, is a mission he would have thoroughly recognized," Shaw added. "Michael Shaw and his team at Reading the Pictures have brought deep analysis to daily news photography," said Brian Storm, founder of MediaStorm, Smith Fund board member and Chair of this year's adjudication committee for the Chapnick Grant. "Their online salon brings together experts and practitioners in an effort to raise visual literacy." Lynsey Addario, the famed New York Times and Pulitzer Prize documentary photographer delivered the evening's keynote address. Addario's best-selling book, "It's What I Do," is currently being produced as a motion picture directed by Steven Spielberg and starring Jennifer Lawrence as Addario. A recipient of the Smith Fund Grant in 2004, Stanley Greene became one of the leading international conflict photographers of his generation. A founding member of the photographer-owned agency Noor Image he was highly regarded and liked by his peers. He succumbed after a long battle with liver cancer, last May, at age 68. A legendary photo editor and co-founder of the W. Eugene Smith Memorial Fund, John G. Morris was an amazing globe-trotting centenarian. He passed away in July. "A humanist and a pacifist, he was photo-journalism's tireless defender and champion and possibly its most exceptional chronicler and historian. But most of all, he was our friend," said Smith Fund board member, Robert Pledge.